So before we show you the various types of foundations you can use for your shipping container, let’s look at if you actually need a foundation. In short, you will always need a foundation for your shipping container. Primarily, the ground beneath us moves a considerable amount; it can rise, sink or slide. This movement is sporadic and is hardly noticeable but this slight movement will make a huge difference to the level of your container. A foundation will provide a solid stable platform so your containers don’t split and separate. A solid, well built, foundation will ensure the weight is appropriately distributed throughout each corner of the container. It will also help prevent moisture and the corrosion as a result of this moisture. And finally, without a foundation, the doors on containers can be incredibly difficult to open and close, which isn’t ideal! If you’re shipping container home is temporary and will only be left in a certain place for a few months then you don’t need significant foundations- railroad ties (also known as sleepers) will do. 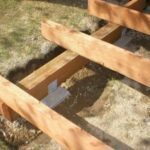 This is the most expensive option, and usually only needed for highly unstable ground, or permanent long-term structures. 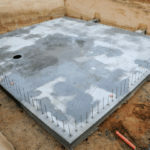 We recommend if a full concrete slab is required, that a professional team is hired to make sure the slab is correctly made and level – hence the extra cost. 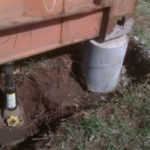 Also known as concrete piers – if you’re looking at concrete footings, you first need to take into account how large they will be, the spacing required between each footing and the time until the container arrives – if you are getting the container quickly, there may not be enough time for the concrete to set properly and this would render it useless. Pay attention and be meticulous – all measurements should be triple checked – because unlike the wooden footing, they are near impossible to move.